A key part of the Unity Music Festival is its focus on prayer in the planning and operational implementation of the event. The core organizational committee for the event includes a prayer coordinator and assistant coordinator. 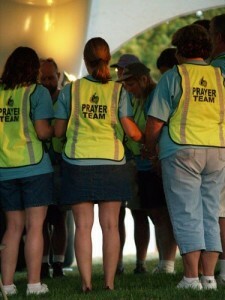 The coordinators oversee a group of people dedicated to praying over the event. This continues throughout the planning process and during the event itself. During Unity, the prayer committee travels the venue in highly visible vests so attendees can easily seek them out and request prayer. Additionally, a large prayer tent is centerally located on the venue for people seeking prayer.